The Provincial Grand Master was delighted to make an official visit to the Tuscan Pillar RAM and Mark Lodges, No.1142. 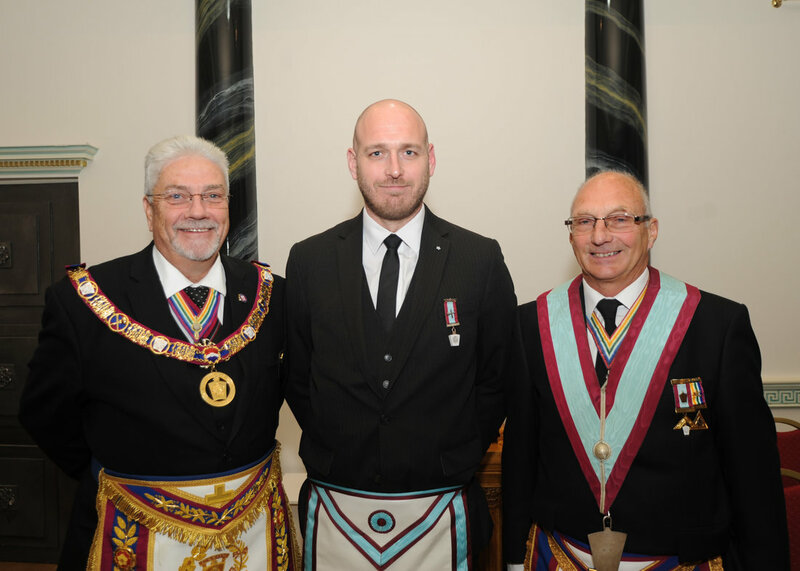 Escorted by the Provincial Director of Ceremonies and attended by a large number of Acting Officers, R.W.Bro. Terry Sheern first attended the Royal Ark Mariner meeting celebrating 50 years since their Consecration. Although they intend to have a more formal anniversary meeting early in the new year, The PGM was able to congratulate the Lodge and deliver an interesting, informative and amusing talk on their history and what was happening in the world at the time. The Lodge was closed and the mark opened. The PGM was received, in procession with his Acting Officers, and he took the Chair to briefly address the Brethren. He also introduced the Acting Officers to the Brethren especially those newly appointed. The Chair was returned to its' rightful owner, W.Bro. Barry Shepperd, and he, along with other Past Masters, with the Lodge Officers, carried out a fine Advancement of Bro. Tony Douglas. The PGM was pleased to present two Grand Lodge Certificates to new members and greet Brother Tony. All eventually retired to an excellent Festive Board with good food and good company. The PGM with Tony Douglas an the WM, Barry Shepperd.